I was setting up to take some pictures of my finished coat (!) 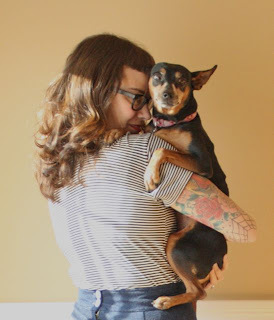 and couldn't resist doing an impromtu Rosie-and-me shoot. Isn't the light kind of pretty? Very late fall afternoon, golden hour-ish. I've been covertly working on trousers a lot lately. These are some high-waisted jeans that I practically live in. I feel like I'm really making some breakthroughs in fitting my basic pant pattern, which I will write about soon! In the meantime, have a fabulous weekend! I can't wait to read about your pants pattern. I have not perfected mine yet. I do find that pants are harder to fit, don't you? How about a pic in your new coat? :-)I cannot wait to see how it looks on you! I love high waisted pants! They flatter my figure. When you figure :-) the pattern out and share it, I will be first in line to buy it!! oooh, very keen to hear more about those high waisters. from what I read it looks a hardest thing to achieve in sewing is a good pant fit! I have a fave pair to copy, complete with side zipper, I think Craftsy have a 'rubbing off' tutorial for jeans so you don't actually have to start from scratch. I may try that but it looks quite a process. Look forward to hearing fitting tips. 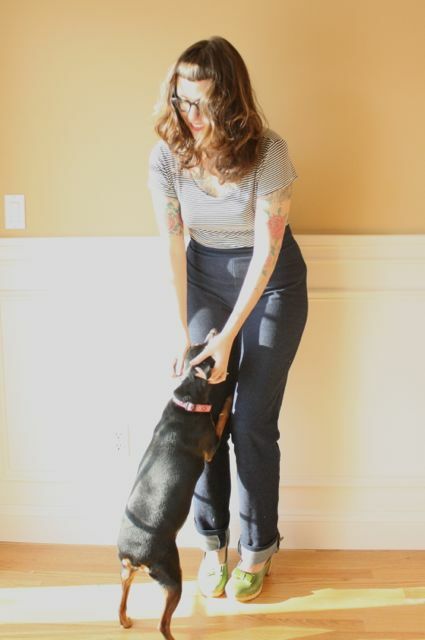 As with all the other commenters, I would LOVE a pattern for high waisted pants. I'm not sure if I could pull them off unless they had some sort of magic in the front to keep in my puku (side zipper, anyone??) but high waisted are SO much more comfortable than stupid low-rise. Also, being quite new to your blog (and loving it), I have noticed something missing. Having a page of all your completed garments would be really useful, for inspiration. I notice a few places you've mentioned outfits you haven't blogged about (which is totally understandable), but just having photos of them would be rad. Edit: Just noticed they have a back seam zipper, even better! The lovely ever-blooming Rosie :) Looking forward to any tips on fitting slacks! Everything you make is lovely, but looks even better when Rosie is in the photo! So m I to understand that this is a pattern that will be available to us soon? Can't wait! 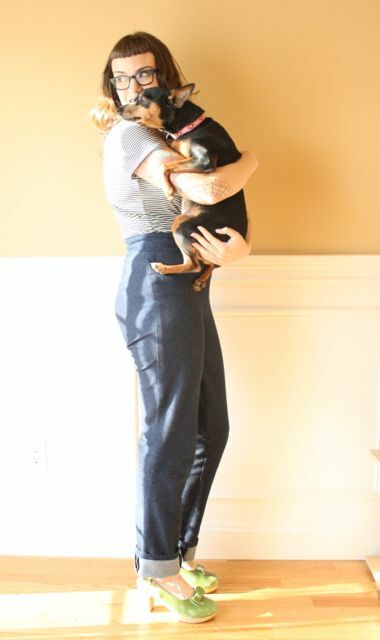 You really rock these pants and your dog looks great too!!! Looking forward to the pants pattern. Girls and women just do not realize how terrible most of them look in low riders. I. Want. Those. Pants!! Please please please make a pattern for us to buy!! So cute! The lighting is spectacular, very professional-looking. super cute everything on the pictures!! there's just something about high waist pants on some figures - I've spent all of my 20s feeling guilty because low waist does not look good on me, until I re-discovered high waisted pants and skirts. this summer I bought 3 pairs (same model, 3 different color), because I find pants very tough to sew. Nice photos!You look cute on that! Looking forth to see more pants! I need some inspiration to get my pant-sewing kicking... You look great in pants too! Those pants look so comfortable and, most importantly, are so flattering to the feminine curves ! I hope to sew myself a similar pair very soon !